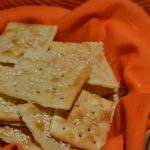 Saltine Crackers and ice make these crispy snack crackers. Perfect for every dip or spread. Preheat oven to 400 degrees. Brush two baking sheets with melted butter. Fill large pan with ice water. Add crackers and let float to absorb water, but not soggy. Remove crackers carefully; allow excess water to drain off. Transfer to baking sheets; mix cayenne pepper with butter. Lightly brush crackers with butter mixture and sprinkle with sesame seeds. Bake 15 minutes. Reduce oven to 300 degrees and continue baking until golden- 5 -10 minutes. Store in sealed container when cool.